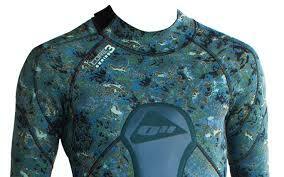 The Ocean Hunter Chameleon Core 3 is designed as a spearfishing wetsuit that is a 3mm in thickness. 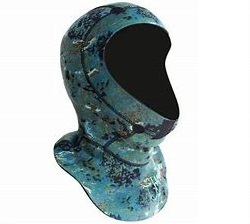 It has a dual camo design specifically made for Australian waters as it is a mixture of blue and green camoflage which helps to blend in to the environment. 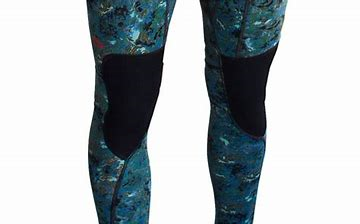 The idea of the camouflage suit is to become invisible underwater and do use it correctly and get the most out of the camo suit, you are to dive down to the ocean floor and lay and wait for the fish to come to you. Breath hold is so incredible important and spearfishing is not as good when you havent mastered your breath hold. Depending on your breath hold and diving depths will determine where you want to be diving, however starting off shallow where you can maximize the camo suit will allow you to hunt to your best ability. When you are laying on the ocean floor, the fish will have no idea your are there and come in closer than you could imagine. The blue/green combo allows you to blend in to a few different inviroments. Being 3mm in thickness the Chameleon Core perfect for majority of the year however in winter a thin vest may be needed for extra warmth or a hood and gloves. The Chameleon Core 3 has a back zipper with Velcro closure, flat lock stitching and hard wearing knee pads for extra strength when on the ocean floor. It also comes equipped with a loading pad on the chest which is designed to be used with longer spearguns where you can no longer load them on your thigh. The Chameleon is a steamer design which means it has long arms and long legs which will also prevent stingers and sunburn. After every use, you will need to clean your wetsuit to get rid of the sea salt and sand. If it is not cleaned correctly it will deteriorate and the zipper could seize up due to the sand. You can purchase wetsuit wash from us at Dive Warehouse which you mix with water and clean you wetsuit in. The sooner after your dive, then better. Try not leave it a few days before you get around to doing it. A great way is to fill the bath tub up when you get home from your dive, add the wetsuit wash and your wetsuit and give it a through clean. Hang on a wetsuit hanger to drip dry ready for your next dive.